My knitting (Rare Breed Sweater) and weaving (huck lace) projects are in progress but without a spinning project, I feel like somethings missing. 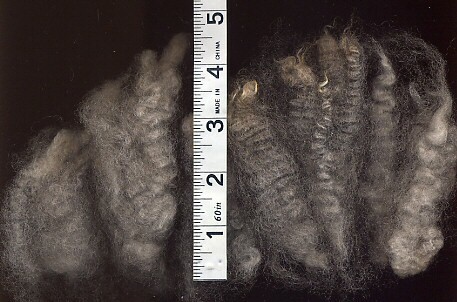 So with rare breeds on my mind, I have been anxious to work with the California Variegated Mutant fleece I purchased at SAFF. I really don't need any more rare breed samples for my sweater, and I really don't need any more fleece, but when I saw the baskets of CVM and fondled its luscious softness, I couldn't help but buy a couple of ounces. My sample contains a variety of staples which show a range of color and crimp. Length seems to be fairly consistent across the sample, about 5 inches. It's not especially lustrous but very clean with no VM or 2nd cuts. The staples are tapered. The crimp is well defined and I have some locks which measure 6 crimps per inch, and some which measure 2 waves per inch. There is a lovely range of color, from pale gray to a medium charcoal. The tips are light colored and range from white to tan. The tips are sound. It is soft enough to wear next to the skin. It had been scoured before I purchased it, so I can't comment on the amount of grease or the percentage of weigh loss before and after washing. I did a little research about the breed, I learned that it was developed from colored Romeldales. Perhaps someone thought that the Romeldale color genes mutated to produce a wide range of natural colors (????) I'm not sure about that, but I do think it is some of the loveliest fleece I've gotten my hands on recently. I plan to handcard it and spin long draw from rolags. I think it will make lovely yarn. I know what you mean about the need to spin! I have spun CVM from a west coast dealer who cards the fleece, dyes it (sometimes) and mixes it with other fibers. Lovely stuff. Black Pines Sheep in Eaton CO is a good place to buy - clean, gorgeous... Uh-oh... I feel a craving for a CVM fleece coming on. re: holidays...or should I say holidaze! DD finished her list although there is something that she can't remember. DH & I don't know what we want and other than the candles for a fundraiser, I don't know about Mom & MIL. I have a feeling that all the extra from the house will hide in my computer room w/ the door closed instead of truely getting cleaned. Love the kitty helping pix below. Catzee seems like she might not be so helpful. Do post the piccies when you spin it. That is a nice looking fleece. I am learning to like the greys. They are growing on me as of late. I always had a hard time with anything but white. 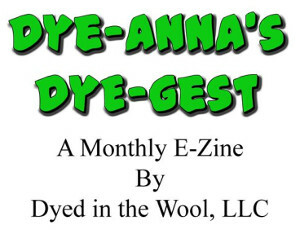 I've had the notion that I must dye all fiber. One of my rams carries the colored wool gene they have it noted on his pedigree, so maybe in the future. Ooo, but it's so much fun to dye grays! Especially the light ones, they make such gorgeous colors.